A survey posted in online discussion groups brought out some insightful comments, which follow. 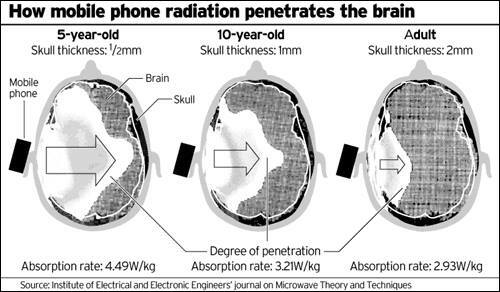 "When it comes to EMFs, studies have shown that [children’s] thinner skulls and bones allow them to absorb twice the amount of radiation as a grown-up. EMFs can more deeply penetrate their brain tissue, which is more conductive than an adult’s because it contains a higher concentration of fluid and ions. One study found that a cell phone call lasting only two minutes causes brain hyperactivity that persists or an hour in children." I read they are coming out with a even faster cell phone - with EMF's that are very harmful to trees and plants. Where are the laws - when will it stop ?? When I switch on bluetooth or Wifi I can not sleep and my body becomes restless. I noticed that sexual desires also increase when people are exposed to EMFs. Yes. I get pain in my head, dizziness, & nausea. I have not found relief. I unplug WiFi when not needed. Never put phone in my pocket (No one should, especially kids.) Always use speaker phone. What countries, Jennifer Williams? My wife and I have explored Ecuador, the Hawaiian islands, and several European countries. I would love to know about the 5%! I live in Ireland and there are still about 10% of the country that's off the grid. Ah! Ireland! Wow, what a coincidence that my wife and I were just talking about Ireland not an hour ago. She said Ireland wants to get off fossil fuels within a certain time frame. We are both drawn to Ireland -- and Kati is a German citizen, which might help with immigration. But we need to find a way to supplement my social security retirement income. Can't live in a yurt there through winter like we have done in central California. How do you know it is from EMR, Justlyn Hartley? I can't stand the hum of appliances and things pulling all the energy into a place. I also feel weak and faint like with a sort of nausea when I go around the electrical poles with scanners and such on them in public stores. That sounds like real sensitivity to me, Coral Fairbanks. Have you tried anything like the Orgone devices to reduce the effects? I have two of the best I found, on the battery compartments of my two TENS devices. Can't say for sure if it is actual, placebo or wishful thinking, but it does feel like it makes a difference in the quality of the electrical stimulation over the electrode pads. Now my eye is on more advanced devices as I feel they may provide benefit beyond protection from EMR. Coral, I too can't stand the hum of electrical things and can hear/feel it..especially certain types of lighting like at stores, doctors, etc...orgone seems to help, as does black tourmaline&smoky quartz crystal..
Gary R. Smith, an ex boyfriend gave me an orgone pyramid quite a few years back. I wasn't sure of its full potential for years. It honestly wasn't my favorite because within the resin pyramid mold, looks like 3 fake sunstones along with some real looking amethyst. I always sat it in front of television anyway.more for its beauty. When I moved a little over a year ago I started putting it elsewhere. In my old home I never really felt the stresses from the appliances so much but being here has been a bit more stressful. I now have a dishwasher that stays plugged in too (invented in this town). I'm putting my orgone pyramid back out now set with new intentions and I feel a connect with it. Thanks for bringing my attention to it. As for TENS units, I don't have any and am not sure how comfy I'd be with carrying one around. I am unsure of how they would help. Can you please share what is going on. Does it disrupt the other waves in the environment? I feel the sickness more so when I'm in the stores and like Justlyn Hartley said above with certain lighting in places. I'm curious and need to research more on this phenomenon. I have self diagnosed myself with misophonia too, so I am sensitive to certain noises at certain times anyway. May be a correlation there..hm. I do carry around a black tourmaline the "universe" sent me and use other gemstones for protection and healing. I had thrown a lot of them in the river because of stinking religion and now miss a lot of my stones, including my smoky quartz...good for clearing negative energies. Oh I also have a salt lamp that seems to help at least lift my mood. Negative ions like a thunderstorm and all. Coral Fairbanks, we have misophonia in common. I just now saw this comment, and my best response is that I am currently writing pages on EMR which will answer your questions in a more thorough and reader friendly way than I can here. Will let you know when it is published. How do we know about EMR any symptoms? I like your comment, Maria Nep, but do not understand it. Are you asking what is the scientific basis of electromagnetic radiation and its toxic effects? Much research has been done, Maria, and much is written online about the scientific basis of electromagnetic radiation and its toxic effects. Here is from an article on Wellness Mama: Electromagnetic fields (EMFs) have been around since the beginning of time as we receive natural EMFs from the sun and earth itself. It wasn’t until mankind learned to generate electricity (and EMFs) that we hit technological breakthroughs like lightbulbs and radio communications. More than 100 years later, we now enjoy and have become almost completely dependent on high-performing computers, microwave ovens, and many other wireless technologies. I used to avoid the main server room because I'd get headaches if I stayed in there too long. Sensory overload, agitation, sleep problems and general anxiety. Remedied through regular mineral baths, earthing and "unplugging" for several hours a day. There are crystals that can help. Turquoise was suggested to me for a friend who is an electrician! What I feel depends on frequency and amplitude of the EMR. The trick is to ID the frequency to be able use the phenomena as a tool in life. The ELF before earthquakes. IR from a hidden fire. Even soft Xray that let's you 'see' inside. Observe and practice your skills to make it a reliable tool. Great, Stephen G Bettinger. In my communication with conscious electrons, I was 'told' that humans have the capacity for senses beyond the five physical, including 'frequency awareness.' How do you ID the frequency? Gary R. Smith learn physics. As you understand it things become apparent. How low freqs 'punch through' , higher freqs can bend. When the energy will bounce off or blast in. This will lead you to the double slit experiment which leads to the wave/particle duality and the observer effect, that takes you to quantum entanglement where the fun begins. Yes, this week I received the book by Albert Einstein and Leopold Infeld, 'The Evolution of Physics.' Just finished reading 'ELECTRIC UNIVERSE' by David Bodanis. But I asked myself the question today, 'Why do I need to know all this physics stuff?' That is not really my central interest. My interest, as way out as it sounds, it to live always in an open heart state to enable greater communication and cooperation with the conscious particles, not to dissect, observe, measure and study them. I want to understand them but not manipulate them. That understanding for me is best gained in a direct way. Thank you for writing. Gary R. Smith understanding the physics of how things work has allowed me to become a better empath among other skills. Becoming a better empath, or person in general, is a good reason for any endeavor. Not to oppose, I am just wondering, Stephen G Bettinger -- does intellectual understanding bring us closer to, or separate us further from, the object of our mental comprehension? Would you approach a new relationship by analyzing a person or would you reach out for a more felt understanding? In this, physics has it all wrong by viewing particles and waves as things. Science in general thinks it has free rein to manipulate whatever it wants for selfish gain. Although, Steve Preston wrote, 'As Einstein and relativistic thinking dictates, this 'controlling interface' MUST be part of the conscious entity of a universe observer.' - Slip Through a Wall, p 131. I don't choose to analyze any further, but seek to know and merge. Gary R. Smith Read up on the observer effect. A photon acts as a wave until you observe it. Then it collapses into a particle at that point. The observer changes the reality. Weird but true. Could it be that the observer and observed are one and the same? I feel nauseous, shaky, get a headache, have difficulty concentrating ... just all around icky feeling. If you are talking about generating a strong EM field yourself that's a different subject. In the old days I would blow the computer modules in LED watches with my EM field. I can interfere with radio transmission if I want to. MRI's will goof me up for hours afterwards. CT's not so much. Mastery of your EM field takes fiddling with it and observing the results. Then you practice and train. Stephen, you can interfere with radio transmission if you want to, so it is in your conscious control. The electrons have told me that for communication and cooperation with them, a human must be in an open heart state. A closed heart is like resistance in a wire to electrons. To the greater degree the heart is open and serving the One Being, the more there can be cooperation. The One Being is the Net of nets of conscious particles, it is us. Well, anyway, that is what the electrons said. Thank you for your participation.